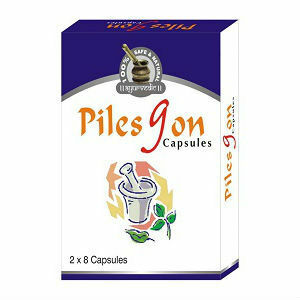 Pilesgon Capsules is an herbal treatment for hemorrhoids, internal and external, and bleeding piles. The makers of Pilesgon claim that this product relieves pain and discomfort when passing stools. They further claim their product to have astringent properties that tone vascular musculature and improve the elasticity of hemorrhoid veins. It is recommended to take one to two pills twice a day with water for 2-3 months. Pilesgon is offered for $22 a bottle of thirty two capsules. If you will be taking the maximum recommended dosage, that’s only a little over a week’s supply. Pilesgon offers a thirty day guarantee for an unopened product only, minus a 25% re-stocking fee. Even if Pilesgon is true to their claims, the fact that their product takes 2-3 months to be effective puts them behind the game in choices for hemorrhoid remedies. The price is a bit exuberant as well at $66.00. These facts, coupled with the lack of customer testimonials, should make a customer hesitant in buying this product. John Parker	reviewed Pilesgon Capsules	on October 22nd	 and gave it a rating of 2.